A PC or virtual machine running Windows 10 Insider Preview. Register with the Microsoft Connect program to download the Windows 10 IoT Core Insider Preview image. 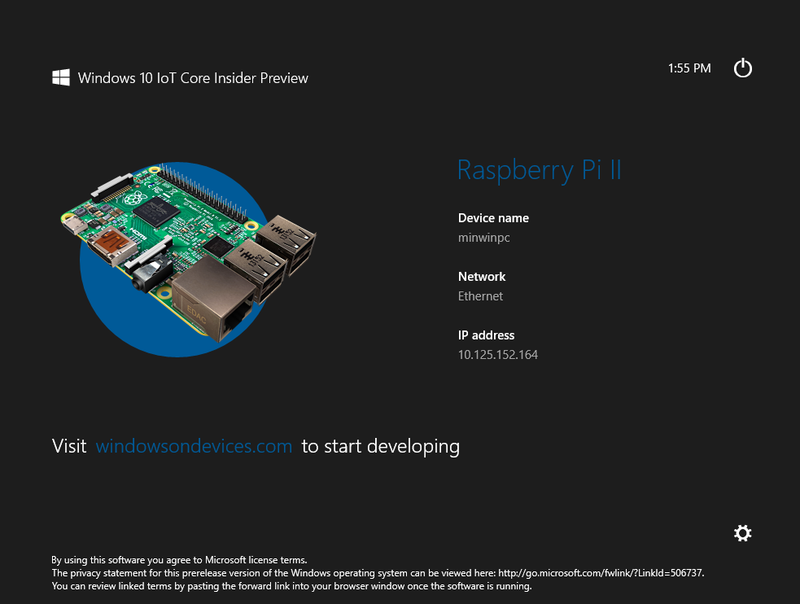 They release the Windows 10 IoT Core for Raspberry Pi 2 through the program Microsoft Connect. If you have not signed up yet, please go to the program site on Microsoft Connect – https://connect.microsoft.com/windowsembeddediot/SelfNomination.aspx?ProgramID=8558 – to sign up. If you’re already signed up for this program on Microsoft Connect and try to sign up again, you will just see a blank page. 5V micro USB power supply with at least 1.0A current. A 8gb Class 10 (or better) micro SD card. HDMI cable (if display is desired). Microsoft has provided a utility to provision your SD card with the Windows 10 IoT Core Insider Preview. The following steps can only be executed on a system running Windows 10 (build 10069 or higher). If you see a blank page or no downloads listed, please make sure you are signed into Microsoft Connect by looking at your login information at top right part of the screen. If you did not sign up for the Microsoft Connect program, please refer to the instructions in the “What you need” section above. Modify a basic USB device driver to run your SD card as a hard drive. Open the “Disk Management” and set your device offline, because only offline devices can be attached as SCSI devices in Hyper-V! Add a SCSI device to your Hyper-V virtual machine and select the physical hard drive (which should be your SD card) in the dropdown menu. (If you have a virtual machine, you have to download the image inside the virtual machine, to be able to continue). Now insert an SD card into your SD card reader and open an administrator command prompt and navigate to the folder containing your local flash.ffu. Click on the “Safely Remove Hardware” icon in your task tray and select your USB SD card reader to safely remove it from the system. Failing to do this can cause corruption of the image. Insert micro SD card you prepared in the section above (the slot is on the opposite side of the board shown below). Connect a network cable to the Ethernet port on the board. Connect an HDMI monitor to the HDMI port on the board. Connect the power supply to the micro USB port on the board. Windows 10 IoT Core Insider Preview will boot automatically after connecting power supply. On the very first boot the you will see a blue windows logo and then a black screen for a long time (2 minutes or longer). Do not power off the board while it is doing first-time setup. The board will then reboot to a blue-screened application that says “MinWin” at the top. It will sit on this screen also for a long time (2 minutes or longer). Again, do not power off the board while this is occurring. Finally the board will reboot a second time to show DefaultApp, displaying the IP address of the Raspberry Pi 2. Follow the instructions here to use PowerShell to connect to your running device: http://ms-iot.github.io/content/win10/samples/PowerShell.htm. It is highly recommended that you update the default password for the Administrator account. Please follow the instructions found in the PowerShell documentation. Remote Debugger will launch automatically when your Raspberry Pi 2 boots. 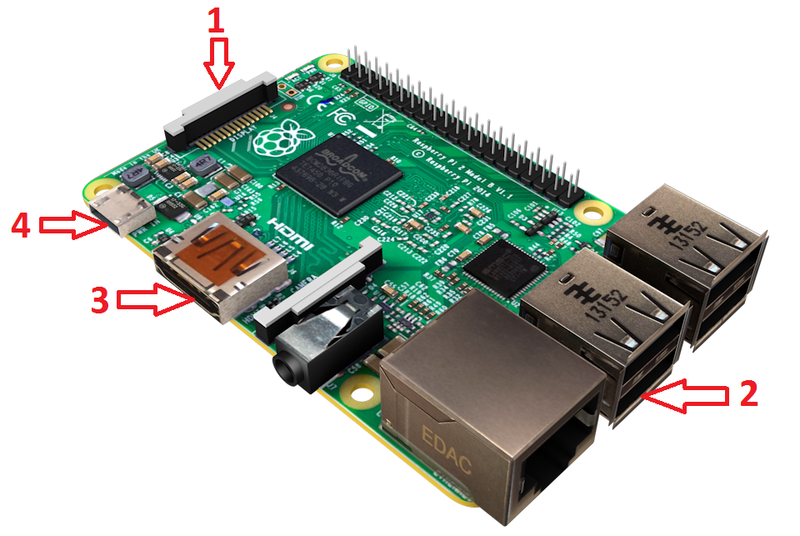 Now you have your Raspberry Pi device running Windows 10 IoT and you are ready to deploy your apps with Visual Studio 2015 to it. Let me know about your projects and what do you think abou the article. The article is based on content published by Microsoft, as well graphics are provided/copyrighted by them, for reference see: https://dev.windows.com/en-US/iot. In which directory do you try to execute the dism.exe command? 1) You have to be in the directory, where you have extracted the downloaded Win IoT preview image. 2) Have you started your command line as administrator? Let me know, if it works now. so run CMD in admin where i have the image in? i’ll try it when i get home from work. i’ll let you know, thanks. hey, just letting you know that it worked! thanks!!! That’s great. Follow my blog and my twitter #fraissit to stay tuned to all that stuff. Would also be great, if you spread the word about my content. Is there a way to install it from Windows 7? Windows 7 Dism.exe does not have /apply-image option. The answer is no. The dism.exe Version in Windows 7 and/or Windows 8 doesn’t have the /apply-image option, moreover it can’t write images to a SD card. You have to use Windows 10 in a physical or virtual environment to be able to install it to your SD card. Thank you for mention me. At which step, do you need to install VS2015? I guess I should read instructions better. I started the install msi rather than make the FFU SD image. All set now. A bit underwhelming. But will see what it takes to develop an app. Great 😉 Happy developing. Let me know about your projects. i have a small Problem here in installation. i followed your setps. Hj! Hmm.. 1) what type of SD card do you use? 2) how many minutes did you wait for finishing the process?